SHADYSIDE — It may have been Barnesville’s season-opener, but Jagger Jefferis was in mid-season form Wednesday. 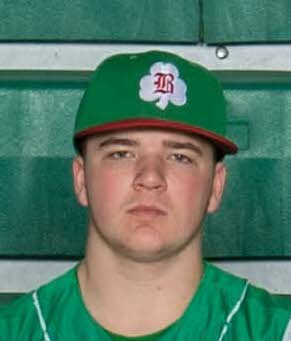 The lefty fired a no-hitter as the homestanding Shamrocks blanked Shadyside, 3-0, in high school baseball action at Fleming Field. Jefferis needed just 81 pitches in recording his gem. He fanned nine and issued a pair of walks. He also singled twice. Jake Edwards rapped a two-run single in the third to give Barnesville its final three-run cushion. Zack Thompson had an RBI single. Collin Holmes struck out five and walked three, while Bryce Amos fanned a pair and walked one. AT MORRISTOWN, Tyler Tonkovich struck out nine and walked one in firing a 3-hit shutout against the Jets (2-1). He also singled and doubled to drive in a run. Dustin Carrothers swung a hot bat for the Red Devils (1-1) with two singles and a double that produced four runs. Will Balgo had three singles and a trio of RBI. The two teams meet again today at Memorial Park. AT CADIZ, Owen Long had two hits and an RBI to help Buckeye Local split the season series with the Huskies in a game that was moved to Harrison Central from Connorville. Bryan Balzeski had a hit and knocked in two runs for Buckeye Local, while Fered Hertler and Lance Novak also drove in runs. Trevor Carman had two hits for the Huskies (2-1). AT NEFFS, the Purple Riders (2-0) completed their two-game sweep of the Big Reds (0-3) at John Blacker Field. Jacob Probst laced three singles that knocked in a run while Drake Dobson added a single, double and run batted in. Winning pitcher Trevor Hanson clubbed a three-run double in the seventh. Hanson worked the first five innings, striking out half-a-dozen and issuing three free passes. Logan Meeker worked the sixth and seventh. Chase Nolan singled, doubled twice and recorded Bellaire’s lone RBI. Martins Ferry plays St. Clairsville Friday at the Niekro Diamond in Brookside. Bellaire, meanwhile, travels to Cadiz today to meet Harrison Central on Robert Mazeroski Memorial Field inside Sally Buffalo Park. AT CONNORVILLE, the Huskies banged out 19 hits in rolling past the host Panthers. Kobe Johnson led the hit parade as she came up a double shy of the cycle. She singled, tripled and smacked a solo home run to account for four RBI. Britton Positano added a trio of singles and a run batted in, while Madison Young drove in another with a single and double. Danyel Beadling contributed a single, double and three runs batted. Winning pitcher Kaylee Elliott singled three times to knock in a run and Jenna Young had a run-producing single. Joclyn Peshek doubled in two runs and Lexi Fergsuon blasted two doubles. Elliott struck out six and walked three while scattering seven hits. Alexia Williams singled and hit a solo homer for Buckeye Local. Camryn Case singled twice. AT MORRISTOWN, the Red Devils (2-0) remained unbeaten courtesy of a 10-run outburst in the third inning. Taylor Gallentine led the 11-hit assault with three singles and three RBI. Hannah Thoburn knocked in three runs with a single and triple, while Bree Bennington and Alexis Hines evenly divided two singles, a pair of doubles and four RBI. Paris Stachyra singled in a run. Winning pitcher Jenna Jaskowiak struck out four and walked three before giving way to Gallentine in the fifth. She fanned five and issued three walks. Jaskowiak doubled in a run to aid her cause. The same two teams meet on the North Market Street diamond in St. Clairsville today. AT BARNESVILLE, Shaylei Giesey struck out 10 and wlaked three as Monroe Central topped Barnesville at memorial Park. Kristen Friday and Allee Zwick both belted two hits for the Seminoles, with Zwick driving in a run. Desti Broomhall tripled for the Shamrocks, with Baylie Leach and Mikaela West both doubled. Madison Detling drove in a run with a single. AT BRIDGEPORT, Brooklynn Ruble fired a 1-hitter and struck out 13 with four walks as the Bulldogs debuted in a game called in the bottom of the fifth due to the 10-run mercy rule. Bri Conaway singled twice and doubled to drive in three runs for Bridgeport. Angela Sommer drove in two runs with a single and triple, while Sierra Simeth added a single, double and run batted in. Jaren Tucker slapped two singles to drive in a run and Jaida Kusic had a run batted in. The Dragons lone hit was an RBI single to center by Briana Boggs with two outs in the third. Bridgeport treks to Woodsfield today to meet Monroe Central. Magnolia 4, Shadyside 3, 9 inn. AT SHADYSIDE, Paige Brill slammed a solo home run in the ninth inning as the Blue Eagles outlasted the host Tigers (0-4). Winning pitcher Ashley Tharp also homered and finished with two ribbies. She also struck out 13 without a walk and spaced out seven hits. Kiley Jo Baker singled twice and doubled for Shadyside. Holly Butler had a run-scoring double and Tory Hendershot two singles. Mattie Reiman doubled in a pair of runs. AT BELLAIRE — The visiting Cadets (2-2) scored three times in the third, fourth and seventh innings in downing the debuting Irish. Sophia Recrosio singled three times and tripled to account for three runs, while Karena Recrosio added a singl;e, triple and RBI. Lizzie Stern had a two-run double and Emma Robinson and Kelsey Smith each doubled. Smith fanned four and allowed four hits. Kasi Gillespie hit a solo homer for the Irish. Kyla Kull doubled. St. John visits Toronto today. heads north on Ohio 7 to face Toronto today.